I recently had the pleasure of going to several dealerships in Toronto in search of the perfect luxury SUV. The goal was simply to find a car that delivers the following characteristics that I was looking for. They are set in the following order in rank by importance. Power, Comfort, Luxury, Interior Cargo Space, Ride Handling, Technology, Interior Aesthetics and Quality, 4 X 4 Capability (Let’s get honest this is the least important factor for a city dweller like myself). You can’t have it all in one car unless you have an unlimited budget so, for me, the most important characteristics I was looking for was Vehicle Power, Confort and Handling, and Technology. The Range Rover Velar comes with many different engine options the one I am reviewing is a 3.0L Supercharged V6 with 380HP, 516 ft. lbs of torque and a top speed of 250 km/h. The car gives you very smooth acceleration upon demand and as soon as you ask for a little more power the car delivers instantly thanks to its supercharger. A supercharger (for those who want to know the difference between a turbo and a supercharger) is an air compressor fitted to the engine that increases the pressure or density of air supplied to the engine. This gives each intake cycle (in this form all 6) of the engine more oxygen, letting it burn more fuel, thus increasing its power. The downside to this is that it becomes a thirsty fellow during demanding or aggressive pedal requests. As a whole, the car is adequately powered although it’s missing a deep noise that comes from those throaty v8 engines. Some will say that because it’s a V6 it saves on fuel, however, I didn’t find that to be true. Well, at least I am assuming that not to be true. Since this car is fitted with a V6 I can never really know what kind of fuel economy I’d get if it was outfitted with a v8 engine. I would guess that if this vehicle had a v8 variant due to its weight it would perform slightly better since the supercharger is quite a thirsty way to deliver power I’d love to know how that feels. I recently spotted a video showing the 2019 Velar sporting a v8 under the hood. All in all the vehicle feels 80% adequately powered and 20% lacking some thrust you’d expect from a car that looks like this. The interior of the Range Rover Velar p380 R-Dynamic HSE is quite plush and comfortable. The seats are comfy and subtle, the options to adjust the seats are plentiful and the ride is as smooth as any vehicle in this price range. When you select comfort mode the ride becomes even smoother. The Velar acts springy and quiet on the ground but somehow totally keeps grounded with the asphalt. You get the sense that when this vehicle moves you are in total control and it feels wonderful. The steering feels precise, intuitive and completely fluid with a strong and balanced road grip that isn’t surprising but again feels incredible. The overall ride and handle of this car are in my opinion 8 out 10 if only the vehicle came with enhanced tires we may see this vehicle reach a 9 or 10. The air suspension isn’t that noticeable other than provides a softer feel at lower speeds, and at 80 km/hr, the vehicle auto lowers itself for proper aerodynamics. The money really is in the Comfort mode, it just feels luxurious to drive and if any car salesman is reading this that’s the mode you should have it in for all tests drives. 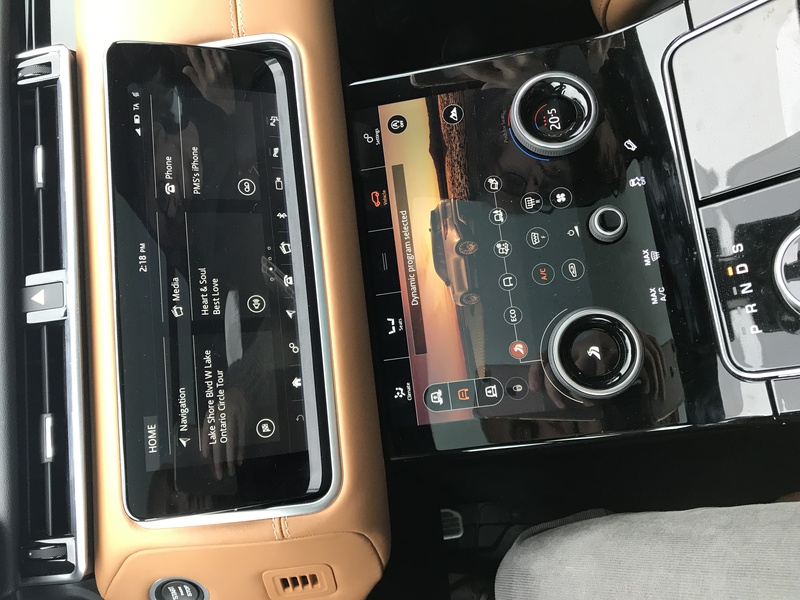 Range rover as of 2018 has introduced a new system called the Touch Pro Duo dual-screen infotainment system in the center dash of some of its vehicle’s that we know of. We know the Range Rover Sport and the Vealr will both be equipped with this new system. 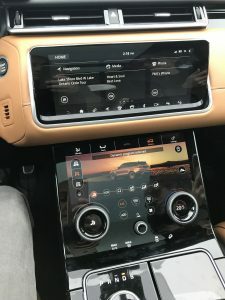 With the new colorful screens, the driver can adjust his/her climate control, adjust the seat massagers or cooling, change the velar’s drive modes (through a touch screen or a toggle), and also choose what media you’d like to listen too from either the top screen or even the bottom screen. The third display can also be adjusted to show a full map or half, you can even change the color of the background it’s totally customizable. The car looks and feels very futuristic, although after a few hours you get so used to it that it no longer seems impressive. The screens remind you of what it’s like to interact with your iPhone or Samsung device. The R-Dynamic comes with a host of self-driving assists modes. The car literally keeps you in its lane, parks itself, slows down in traffic and helps you avoid accidents. The accident avoidance system can be a tad bit annoying from time to time but something deep inside says not to turn it off. Driving around with all these features feels natural and you begin to realize that in the next ten years, we can only imagine how technology, driver, and vehicle merge to make us feel very comfortable.